The person that is responsible for this graffito named himself "El Odio" (lit. The Hatred). Dunno, who he is and why he chose this name. My guess is it is a reference to graffiti's bad reputation. It is just after 7 o`clock in the morning.....I have to say that I suddenly SMILED seeing this strange and nice pink "person". I like graffiti that has some sort of positive meaning and is arty! I don`t like people who just sling big letters and signs over other peoples walls. This photo has nice colors and composition, I also like the blue iron fence to the left..
Have a nice weekend! I look forward to see more from Buenos Aires. Something of a odious variation of the Hello Kitty aesthetic here. Looks funny to me, with the pink and the flowers. Well, hatred consists of several levels. For example, I may hate something or someone for the evil they do and find that hatred energizes me to do something about it. When I say I "hate" graffiti, it means I get a nauseous feeling when I pass by it and wish whoever did it would spend a couple of days in jail. But then I never think about it again. Until you post a picture like this! Heh. Heh. El Odio painted a couple pieces for Art Factory, a hostel in San Telmo I used to blog for and live in, and when I do my Art Walks I'm always pointing his stuff out on the streets. 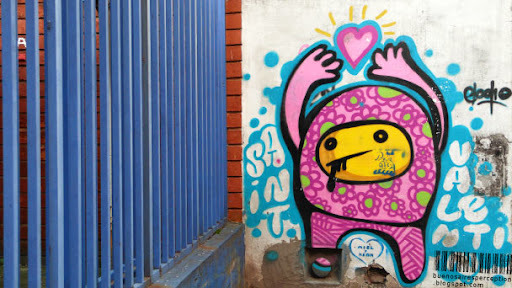 Along with Grolou, he's the king of san telmo graffiti art. If some thought and skill went into the graffiti, I like it. This is fun. This guy with such name doesn't look angry at all. The image looks bubbly to me. If you guys are fans of graffiti, particularly in Argentina, there's a new book called Textura Dos Buenos Aires Street Art with lots of images from San Telmo and all over the city.